This web site is intended for persons who believe in, and are already familar with the history, facts and general story of Johann Earnst Elias Bessler. This web site is an advanced course of study in the works of Bessler and as such I have dubbed it Bessler 401 because this is not the place to start learning. Bessler 401 is the result of study, experimentation, meditation, building hundreds of models, and following every possible clue. As my research progressed some of the clues started locking together like bits of a jig saw puzzle but it is by no means complete. If nothing else maybe it will help to clear up this confusing subject for me. 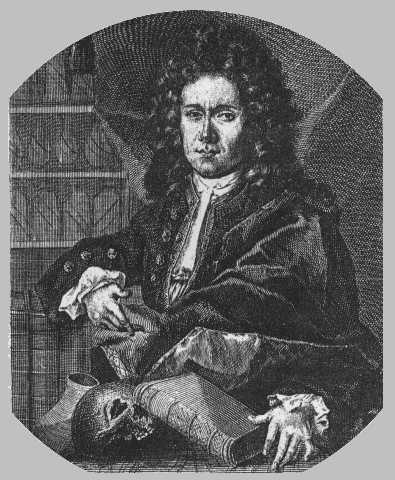 I am putting my research on the web because I would rather pass on discoveries than carry them to the grave like Bessler did. Subjects of this kind of importance should not be relegated to a few independent souls working behind closed doors. Only by getting the accumulated information out to everyone will the solution be discovered. This website will present the researcher with all thoughts and ideas, valid or not. Since the solution has not been found all options are open so please join with me as I re-examine the clues. As a minimum the serious researcher who will have the patience to complete BESSLER 401 should be familar with and/or have copies of the main drawing in Grundlicher Bericht (Grund), the three main drawings in Das Triumphirende(DT), the encoded passage from Apologia Poetica, and a full copy of Maschinen Tractate(MT). If you're looking for low priced electronic copies of Bessler's original books and drawings with English translations they are available on John Collins website. I am in no way associated with Mr Collins except for considering him as a personal friend and respected collegue. Investigating Bessler's wheel for me has become as much a study of the psychlogical understanding of the man, as a physical evaluation of the materials he left behind. I find him to be an honest and forthright Christian man. Determined, daring and confident yet disgruntled and paranoid especially a couple of years after his discovery. Bessler's clues were purposely vague and esoteric yet he printed significant statements in such a manner that people tend to just glaze over them. Other places Bessler makes casual comments that are a little out of place or unnecessary to say it that way, kind of thing. Dissecting and studying, comparing and contrasting and reading between the lines has yielded some fascinating and meaningful clues. I am sure not everyone will agree with my interpretations but I would invite them to come up with better material or more accurate translations. A lot of this material is based on a thorough understanding of the man and his personality with a microscope on exactly what he says. When most people look at these drawings they see only an exterior view of bessler's wheel. On the other hand the weighted pendulum arms seen in every one of the drawings were never reported or described by any of the honored guests or observers of Bessler's wheel. In the text keys for the drawings these pendulums are credited with ensuring the wheel would work when attached and for acting as a govenor keeping the wheel from over speeding. I have every reason to believe that some internal mechanism parts like these weighted arms are shown in the drawings. Unfortunately not everything is shown. 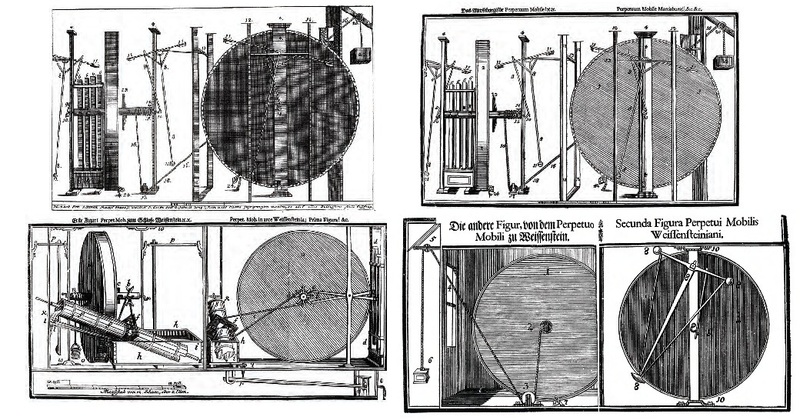 The upper left copper plate drawing is from Bessler's first publication Grund. The other three drawings are wood cut prints from Besssler's last pubilcation DT. The Grund drawing and the first drawing from DT are nearly identical so I call them the twins. There are some minor differences but what is more important are the repeats of what some believe to be mistakes. The first time I saw a reproduction of the Grund drawing was in John Collins book "Perpetual Motion; An Ancient Mystery Solved". I was awe struck and convinced that the answer to Bessler's wheel was right there on the page in front of me. I have spent many years studying Bessler information with a constant eye on those drawings looking for the hints that would further unravel their clues. I have worked with translations from a few different sources and mostly in bits and pieces. My dear friend and pseudo dad, Renatto, has German as a first language and works in a positition that exposes him to old documents. He is uniquely familiar with cultural, language and spelling differences of the 1700's as opposed to modern German. There are differences in any translation because a translation is subjective and Bessler switched languages from German to Latin and apparently some French as needed. Given his familiarity with European languages and previous work, I have every reason to believe Renatto to be quite accurate in content, context and intonation. Some translation material was donated by Al Bacon of Michigan as translated by Ted of Chicago. Without Ted's ability to decipher the almost imperceptible squiggly lines as words this entire endeavor would likely have been completely lost. Click here: Bessler's measuring scale.